Rubbish removal doesn’t have to cause your life chaos. At Melbourne’s own WM Waste Management Services, our goal is to make your rubbish removal requirements simple, efficient, inexpensive and friendly. For all your waste management and rubbish skip bin needs, WM Waste Management Services in Melbourne’s eastern suburbs provides a range of the cheapest walk-in bins for hire and skips with a range of environmental initiatives. Our customers can be rest assured we provide the cheapest prices and highest quality in standard and bin hire from people who are experienced in the industry. Our friendly customer service team are specialists in assisting you with which cheap concrete skip bin hire you to require, advise on the cost of our rubbish skip hire Melbourne and offer a skilled and uncomplicated experience whether the enquiry is via phone, online or email. In only three easy steps let WM Waste Management Services – a trusted and valued name in the cheap bin hire industry. Step 1: What Can Go In a Bin? Step 2:What is the Cost of Skip and Cheap Bin Hire? For the cheapest bin hire services in Melbourne, WM Waste Management Services is the trusted name. Contact us on (03) 9721 1900 today to find out the cost of skip hire or Order your cheap bin hire online. – WM Waste Management will drop off and collect the cheapest bins for hire at a time that is convenient for you. – WM Waste Management offers a reduced rate on top of our already cheap bin hire for bins that have 100% concrete or 100% clean soil in them. – Also known as ‘Roller Bins’, the Walk-In models are readily available for hire and are suggested for the bigger waste removal jobs. Our customers are happy when they discover the low cost of skip hire and our range of cheap rubbish bin hire Melbourne so contact us today for an effective and reliable waste management solution. We have a number of models and sizes available, including skip bins for smaller rubbish loads. Alternatively, for the full range and cost of skip bin hire and the cheapest ‘Walk In’ bins for hire, send us an email or call one of our friendly customer service staff on (03) 9721 1900. An Australian owned family business operating out of Boronia in Melbourne’s south east, WM Waste Management Services has provided with enviable success Melbourne’s eastern and southeastern suburbs as well as the pristine Yarra Valley with rubbish removal services for over 25 years. As an additional service WM Waste Management Services provides services throughout numerous councils in Melbourne’s eastern and south eastern suburbs for hard and green waste. Due to growing demand for cheap skip bin hire in Melbourne’s south eastern areas, as well as positive environmental solutions, WM Waste Management Services have employed nearly 50 Victorians to be actively involved in the drop off and collection of the cheapest rubbish bins for hire and skips and process, recycle, transport and manage this waste. 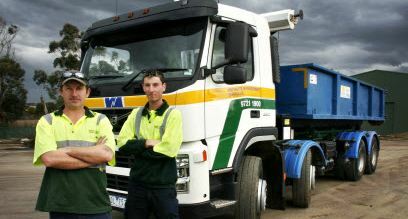 Through hard work and dedication WM Waste Management Services leads the way in Melbourne. Removing unwanted rubbish doesn’t have to be a complicated or expensive exercise. At WM Waste Management Services our clients are guaranteed friendly and efficient services with a range of cheap bins and smaller skips for hire in Melbourne that will suit anyone’s waste management requirements. At WM Waste Management Services “We care, so we recycle”, so along with Knox City Council who manage one of the most populous municipalities in Victoria, we have established and manage the Knox Transfer Station. The Knox Transfer Station provides a valuable and local recycling and trading centre which reduces unnecessary Victorian landfill while ensuring maximum recycling where possible. The Knox Transfer station make recycling Melbourne’s waste their business and WM Waste Management is proud of this dual commitment to assist in maintaining the natural beauty of the Dandenong Ranges and Yarra Valley. At WM Waste Management we offer cheap concrete skip bins hire Bayswater rates for the removal of waste bins containing 100% concrete or 100% dirt because each material is easily recycled. This makes the choice of a WM bin or mini skip hire Melbourne ideal for the tradesman, landscaper or home renovator for waste removal. Our easy to use online calculator will provide you with a price in relation to your location and bin/skip type. WM Waste Management Services prides itself on doing all the hard work for our clients; rubbish removal is easy, we supply the skip bin, you fill it and then we take it away – rubbish removal couldn’t be simpler.